Spoilers for Bright on Netflix. 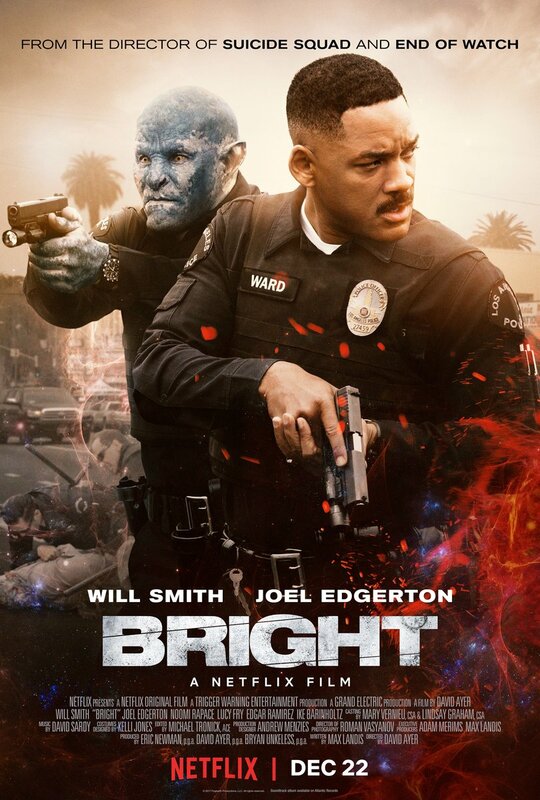 Bright is a movie. It is on Netflix. I watched it Friday afternoon. I have seen worse movies. I expected better. Let's just start with some good stuff. The actors in Bright are very talented. Will Smith, Joel Edgerton, Noomi Rapace and Edgar Ramirez are all great thespians.They have all done phenomenal work in the past and a good deal of that is shown in this movie in small moments. Also, the makeup and special effects in this movie are AMAZING. They work really well and combined with the location shots I feel like I am in an alternate universe's version of Los Angeles filled with people and mythological entities. Director David Ayer is very good at making a realistically gritty South Central Los Angeles film. This film is based off a Max Landis script and if you have been to this blog before you know my thoughts on his problematic track record. 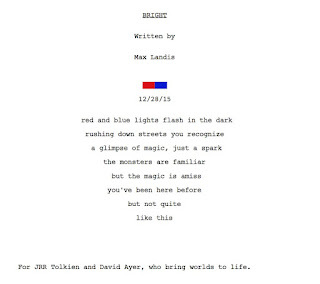 (Update- I can't mess with him or his productions anymore for other things that have surfaced recently but back to Bright) Landis is coming into this with an idea that he is trying to pull off and I think Ayer probably stayed true to this while adding his own take from working on movies like Training Day and, definitely, End of Watch. 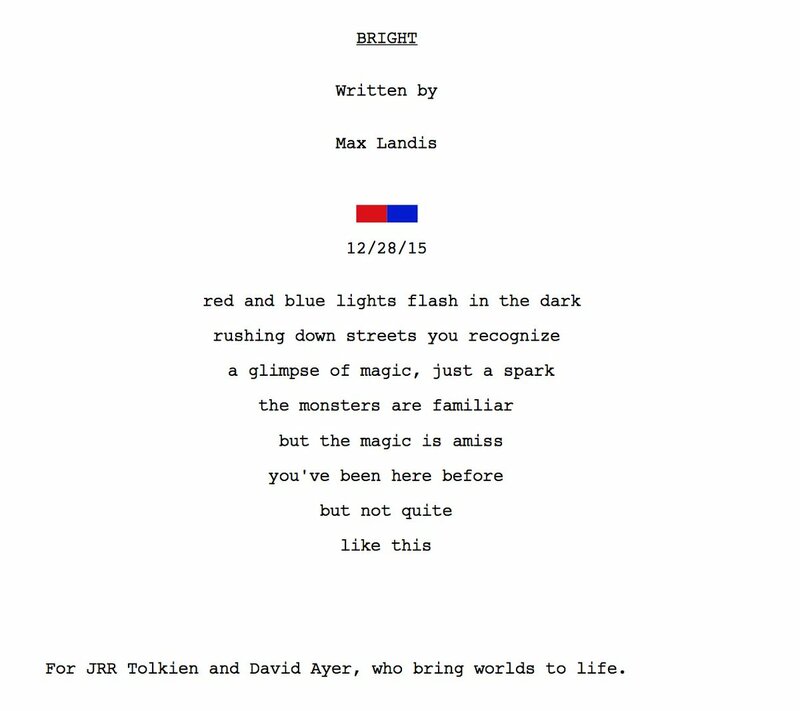 You can tell what Landis' influence is from the first page of his script. He is going to give you End of Watch plus the Lord of the Rings or Alien Nation with elves. "(T)he monsters are familiar" is interesting? So, this is where we begin- a world where there was a great war involving the races of men, orcs and elves and a Dark Lord that was vanquished. The orcs and some elves followed the Dark Lord but he was ultimately defeated and now the races are living together in the world with varying degrees of peace. L.A. appears to be a location where the integration isn't going so well. An orc character mentions Miami and living in harmony with the other races so L.A. is just a bad place for these beings to live next to each other. The city is segregated, pretty much officially with the Elven special district of the former Beverly Hills called Elftown and maybe less officially with the humans and orcs who have their own neighborhoods with some interaction, normally through orc abuse and gang territory fights. Throw in the cops and we have a metropolis with violence always occurring in some form or another. Except Elftown. I'm guessing it's pretty safe there. 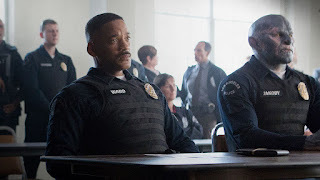 We are introduced to Will Smith's character LAPD officer Daryl Ward who is returning to the job after being shot by an orc while his partner, the only orc officer Nick Jakoby, played by Edgerton, failed to capture the shooter. This breeds mistrust from his fellow officers on top of their bias of him already for being an orc. This is such a problem that Internal Affairs is trying to make Ward record Jakoby confessing to being derelict in his duties to get him fired. Ward seems not totally on board with this plan but will go along because he isn't feeling the partnership himself. Jakoby, meanwhile, is just trying to be a good cop and isn't even aligned with an orc tribe. Because of the other orcs view him as a sellout and doesn't trust him as his role as a police officer. Our new Los Angeles Police Department. Ward and Jakoby go on patrol, one thing leads to another and the pair is thrown into a quest to protect an elven girl who is a Bright, a being who is able to safely use a magic wand without exploding into a big cloud of dust. 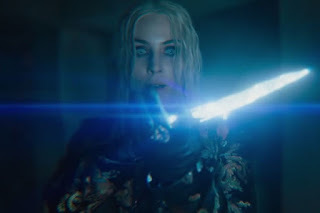 The duo also has to keep the magic wand, the most dangerous object on the planet, away from a group of rogue elves called the Inferni who want to bring back the Dark Lord for some reason. I don't recall exactly beyond they are bad guys who are power hungry. "They are aiding the return of the Dark Lord so he can slaughter billions and enslave the survivors to serve him in a new age of magic." Okay. So, this group of already powerful elves wants more power to oppress everyone and will bring back basically the magical Antichrist to do it. They also killed the Illuminati about a century ago which is something. Anyway, you can tell how this will go. Ward gets his stuff together, realizes he is the "one in a million" human Bright, Jakoby gets respect from his fellow orcs for being a tough and honorable orc and the good guys save the day. The bad guys are still out there being bad so a sequel has been green lit. 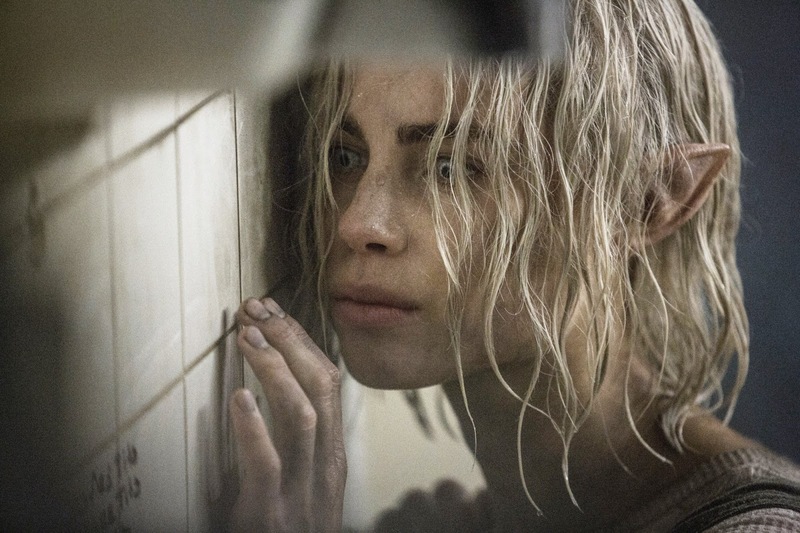 Also, this cast is Suicide Squad alum heavy and I thought this was Margot Robbie for a second. This movie leaves me with a lot of questions- Why does no one mention the two centaur cops? Actually, are there any other centaurs? Are fairies sentient beings or just some form of mythic animal/pest? How long was this war with the Dark Lord? Is there a connected to our reality reason it ended two thousand years ago? Is there no division among the humans that we have in our world? What exactly is the history of this world? These are all mostly silly or not totally vital questions but I think the history one is important. A world is built on what happened in the past and that is reflected in its present. Bright's L.A. seems to be divided as I stated before but there also seems to be the normal interactions of groups that actually exist in out country still. Ward lives next to Bloods, there are a Latino gang that exists near a safehouse for a group of good guys opposing the Inferni and the orcs have their own gang culture. This movie feels like a mess of an allegory story that doesn't work. Even me explaining what is pretty much a simple plot seems confusing to me right now but let's get to it. The elves are generally portrayed as power brokers and jerks but not outright evil, except for the small Inferni group. Humans are humans. The orcs are shown as the underclass that are aggressive and are in menial positions. They are even outright abused by a group of police officers at about 19 minutes into this movie and Ward uses it as an excuse to test Jakoby's loyalty to the badge. It's weird. There is something about this movie that bugs me and I'm thinking that it's the same problem that I have with Lord of the Rings and also the main reason why this movie doesn't fully work for me as it stands. The problem is with orcs and ingrained evil. Just like in LOTR, the orcs are allied with a Dark Lord and are looked down on by the other races. In LOTR, there is some justification in that they are corrupted elves/humans and it's okay to kill and subjugate them for that reason. I can get into a whole thing with the racism of that but with how it relates to Bright, well, they are trying to make a disconnect to that thinking but it still exists. I always support my local Uruk-hai chapter. It's unclear how and why the orcs joined up with the Dark Lord on this version of Earth. Maybe they did it for power like the Inferni are doing now. Maybe they did it because they were being oppressed and the Dark Lord was their way out. The history is murky on this subject in the movie. The fact remains that even two thousand years after this huge event, the orcs are still being judged for this sin. Maybe they were as horrible as these new Dark Lord following elves... but that makes no sense since it appears that the Dark Lord somehow needs three wands working in unison to appear and grant him power. This means you need three Brights and that has been established that elves and the rare human are the only ones capable of this. So, what's a more likely story- orcs are evil creatures that chose to follow the Dark Lord or they were the strong servants of the Dark Lord and his human/elven subordinates? I'm banking on the later and it makes me wonder why did their underclass position need to be kept for two thousand years? To appease the humans and elves and make them forget about their part in the Dark Lord's war? Whatever. All of this can be put to the side and you can believe in the first version of this history with orcs just aligning with the Dark Lord on their own and we still have a problem. The orcs in Bright are generally portrayed as a group of low level individuals in society with an affinity for "gang" wear, such as football jerseys, gold chains, tracksuits and bandannas. At best they appear to have adopted some of the mannerisms of a biker gang but really they read as stand-ins for minority groups, either ethnic Eastern European immigrants or black and brown people in this country. There are definite parallels with Ward's Blood gang neighbors and the Latino gang from Altamira he and Jakoby encounter later. There is even friction between an orc gang called Fogteeth and that last group during the middle of the film. I also get a Maori/Pacifica vibe of adopting some aspects of hip-hop culture, heavy metal music and strong tribal bonds. Those two initial parts of the gang are dialed down in the civilian orcs we do see but the bonds and being "blooded" in a tribe is still seen to be very important. The orcs being beaten by police early in the film are getting this done right in front of their family members or tribe. The assumption is also made by the police that all orcs look alike and are prone to criminality. An officer makes a "joke" to Jakoby about a sexual assaulting orc being his "cousin." We can assume this bias is also true for some members of the general public but we don't know. There are no true positive representation of the orcs shown. The orcs are hitting all the ticks of an oppressed minority group albeit in fictional form. I think that's the big issue for me actually enjoying this movie. We are given this group of creatures that are seen as subhuman by the greater society and they are only redeemed by Jakoby. The Fogteeth leader is trying to unite the disparate groups of humans, elves and orcs, at least for one night, but even he is shown to be a killer. The orcs are brutalized but they are also shown as constantly making or being in trouble when they aren't serving an outside group. This movie feels like it both wants to make a story about the racial divisions in our society while using a mythical group to do it and also try to show that the orcs are pretty much the reason we are in the mess, with their group dynamics that aren't approved by humanity and their past that they can't overcome. A past that the other groups seem to be unable to look pass. A past that the other groups may be responsible for but don't want to take the responsibility of and would instead just have the orcs "know their place." I'm tired of this type of story, especially when it is not done well. Why do we need placeholders about real groups of people to make an audience more empathetic for the plight of those real groups? I'm not sure if that even works with this movie with the way it's presented. The lessons from a normal movie like this would be that one group is being unfairly oppressed and a change is needed or that there are good and bad among all of us. I don't think that is shown, particularly with Jakoby at the end being shown as the exception and the Inferni as outliers of the elven people. I don't even think the Smith's character of Ward learned more than that. That may be reality and it may be how humans are in the real world but it seems an odd place to end with a movie that includes centaurs in riot gear. There is confusion in this movie that can only be resolved with a more concrete timeline presented. The division of the races are shown but how we got here is only vaguely touched on. I really don't need to see a sequel at this point, even if it will answer some of the questions I have. The general feel of this movie is that it is lacking in a good story and the characters as a whole are very unappealing. 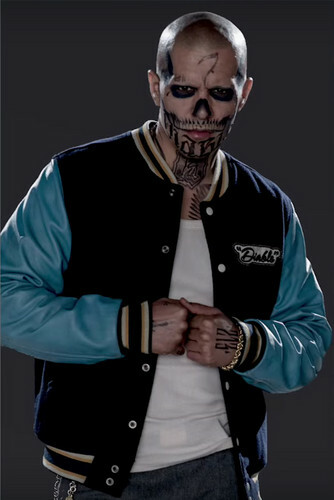 Oddly, just like in Suicide Squad, the only character that I actually cared about fully was a character played by Jay Hernandez in a supporting role as a family man. That's not a good look for a movie where I'm supposed to care and has Will Smith in it as a lead. Or former family man as it were. Maybe you'll get something different out of viewing Bright. Maybe it'll make you think about society or reevaluate your actions or is just a way to enjoy two hours of your time. Maybe you think it would have been better as a series. I have no idea. I thought it was a movie that wasn't terrible but was definitely not as good as it could have been.